Introduction Needlestick injuries and other sharps-related injuries which expose workers to bloodborne pathogens continues to be an important public health concern. Workers in many different occupations are at risk of exposure to bloodborne pathogens, including Hepatitis B, Hepatitis C, and HIV/AIDS. First aid team members, housekeeping personnel in some settings, nurses and other healthcare providers are examples of workers who may be at risk of exposure. Preventing Needlestick Injuries in Health Care Settings WARNING! Health care workers who use or may be exposed to needles are at increased risk of needlestick injury. Such injuries can lead to serious or fatal infections with bloodborne pathogens such as hepatitis B virus, hepatitis C virus, or human immunodeficiency virus (HIV). Eliminate the use of needles where safe and effective alternatives are available. Implement the use of devices with safety features and evaluate their use to determine which are most effective and acceptable. 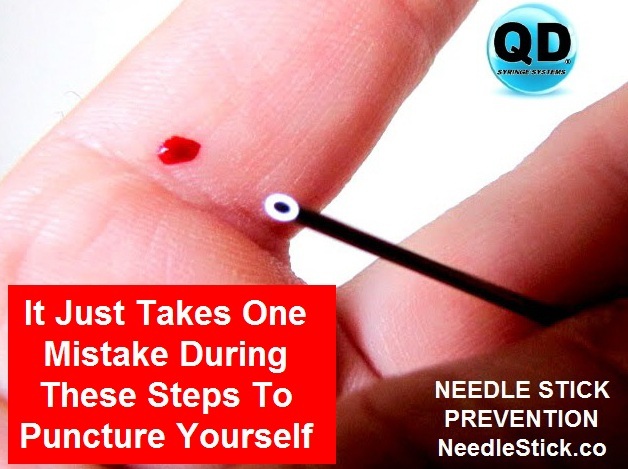 Needlestick injuries can best be reduced when the use of improved engineering controls is incorporated into a comprehensive program involving workers. Analyze needlestick and other sharps-related injuries in your workplace to identify hazards and injury trends. Ensure that health care workers are properly trained in the safe use and disposal of needles. Establish procedures for and encourage the reporting and timely followup of all needlestick and other sharps-related injuries. Evaluate the effectiveness of prevention efforts and provide feedback on performance.